For some of us, time is a constant, plodding taskmaster—demanding our attention and dictating our actions. For others it’s a welcome adventure—a powerful tool that we use to make the most of our skills, sharpen our talents, dabble in hobbies, and work toward goals. What’s the difference? It isn’t time. Time is unchanging and beyond our control. The difference lies in how we manage our actions within the time constraints we face each day. Have you ever noticed how easily we lose time? We’ll glance at the clock at 10:00 a.m., believing we have plenty of time to prepare for our 1:00 p.m. meeting, only to find ourselves rushing to finish at the last second. How did that happen? Where did the time go? If you’re anything like the rest of us, we’re guessing you stole it. The top three ‘time robbers’ are: interruptions, procrastination, and poor planning. All of us are guilty of time theft. So what can we do about it? Interruptions are somewhat out of our control. They are sometimes emergencies resulting from another person’s poor planning, but not always. They could be as simple as the constant hum of your cellphone notifying you of incoming text messages, a child’s urgent tug on your sleeve as she asks you to finger paint with her, or a change in direction from your boss. On rare occasions those close to us actually face true emergencies, and we shift our priorities to share our time with them. Interruptions are relationship-based. Because relationships are important to us, we are willing to give our time for them. But that doesn’t mean we can’t reduce interruptions. We can silence our phone when we are working on a project, or spending time with family. We can place a do not disturb sign on our office door while we hone in on our work. We can share our schedule with those close to us so they know when to avoid interrupting us. Interruptions can be classified into three categories: necessary and vital, necessary but untimely, and necessary and untimely. Of course, those things that are necessary and vital will get your immediate attention, but the others can be scheduled or ignored. Interruptions often feel urgent, but they aren’t always important. Ask yourself: Is this truly urgent or does it only feel that way right now? Is it important? It may not be important to me, but is it important to the person who interrupted me? Can it wait? If you are able to distinguish between urgency and importance, you’ll find that you can often maintain a balance between other people’s priorities and your own. If you ever feel frustrated because you can’t find time for your most important activities, stop and think through your day. We’re betting you’ll discover that even with your busy schedule, you found time for procrastination. Why is that? Usually we procrastinate the things we’d rather not do. Writing a term paper, for example, is a killjoy. Many of us would rather get a root canal than regurgitate all the facts and figures we learned in our History of Civilization class. So we do. We fritter away our time on other things that may or may not be important until we’re staring at the deadline and have no other choice but to push through it. And then something unexpected happens. Pushing against a deadline gives us an adrenaline rush. The task that couldn’t interest us at all before is suddenly the only thing we can focus on. Food and sleep can wait. The sense of urgency we feel adds an air of importance to the work we’re doing, which only builds our sense of self-importance. And then, several hours past our bedtime, we breathe a sigh of relief and bask in our accomplishment. We did it! Sure we’re tired, but that only adds to the intensity—it’s another great detail we get to share with our friends. And you can bet we’ll share this story. It’s a big deal! This was a huge thing we did in just one night! What a rush! Oh no! Did you see what happened there? Our brains actually reward this negative behavior with a chemical rush. It’s related to our fight or flight reflex. We run away as long as we can, but when we’re finally cornered against a deadline, our adrenaline kicks in and we fight. Could it be that some of us are addicted to procrastination? Could that be our MO? What happens when we wait too long, and we simply can’t finish it the way we wanted to, (or worse yet, the way our boss wanted us to)? The ability we have to push through and finish important projects is a vital part of being human, but we shouldn’t find ourselves working in that mode all the time. It isn’t healthy. Procrastination creates stress, not only for ourselves, but also for those close to us. Added stress plays a significant role in several health ailments from diabetes and heart disease to anxiety. Here’s another problem. Our life goals don’t always have deadlines. If one of our goals is to create order in our garage, we need to get a handle on procrastination. After all, not many of us wake up each morning eager to sort through the mess in our garage. Without a deadline, it’ll never happen. Here are a few other life goals to consider: Eat Healthier, Exercise, Drink More Water, and Spend Time with Mom. Procrastination destroys our ability to accomplish our open-ended goals. All this talk of procrastination leads us to our third time robber: Poor Planning. The first thing we can do to improve our poor planning habits is to create deadlines for our goals. For example: I will create order in the garage before our Labor Day Barbeque. This allows us time to procrastinate and cram, but we can do even better. Focus on your values. If you value order—if you thrive best when you can quickly put your hand on the tool you need, then organizing the garage is a task that is important to you. If you’re comfortable in chaos, it will be more difficult for you to stay motivated to complete this task. Now that we have a goal with a deadline, we can break that goal down into smaller tasks that are easier to finish. Examples may include: Build storage shelves above the garage door, Learn how to make a folding workbench, or create a fasteners organizer. Write this list of projects on your Monthly Task List, and schedule each of these tasks to be completed throughout the summer. 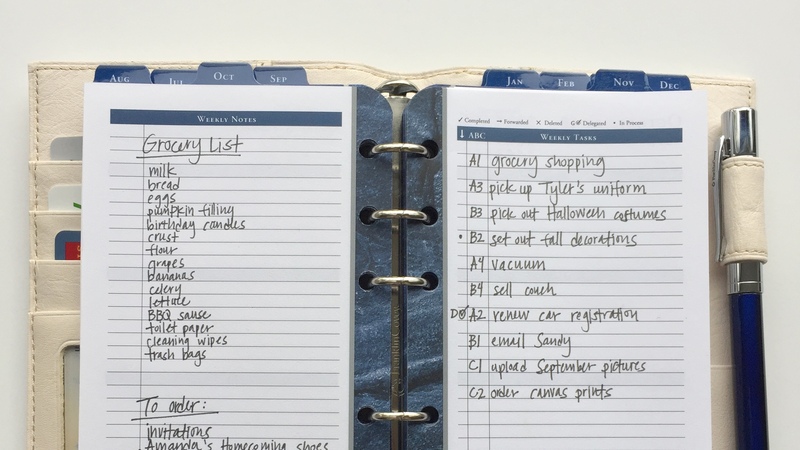 As you plan each week select a task from your monthly task list to work on through the week. During your daily planning break the task into manageable pieces and add them to your daily task list. Prioritize your tasks by importance: A, B, C—and by order 1, 2, 3, and work through your tasks a day at a time. Before you know it, Labor Day will arrive and your garage will be the envy of the neighborhood. What’s more, you’ll have actually enjoyed the process, learned new skills, and accomplished much more than simply creating order in your garage. Living the life you want to live requires creativity and proactive planning, but it also requires an honest assessment of the way you spend your time. Are you running away from the hard or mundane tasks until you have no other choice but to force your way through them, or are you facing them early and developing a plan to achieve even more? Your FranklinPlanner is the ultimate tool to guide your activities and ensure they are in line with the values that matter most in your life. With daily and weekly planning you may not completely eliminate these three time robbers from your life, but you’ll give yourself much more control over the way you spend your time, and ensure that you are achieving what matters most to you.